Get a look at an unsullied urban walkway. Until 2001, commuters hustling through the connecting passageway that connects the IRT #7 and the various 6th Ave. IND lines at 42nd St. were able to view previous neighborhood scenes, as plaques depicting them were mounted on the wall. One of them presented a strange scene of 5th Ave. looking south from 42nd St., showing a large body of water surrounded by concrete. Between 1842 and 1911, the New York Public Library site was home to a large distributing reservoir that not only supplied much of the city’s water, but also catered to the local tourist trade: the Croton Cottage, located at 5th Ave. and 40th St. from about 1845 to 1863, provided refreshment and recreation to reservoir visitors. The Cottage was destroyed during the NYC Draft Riots in 1863. New York's first water system was built between 1837 and 1842. Prior to those years, water for drinking and washing was obtained from cisterns, wells and barrels from rain. Construction began in 1837 on a series of mostly underground conduits that would bring water from the Croton River in northern Westchester County to NYC's spigots. Amazingly, it took only five years to finish the first connection given the technology available at the time. Men and mules mostly did the work in a pre-combustion-engine age. The aqueduct was built on a very slight pitch along its length; the beginning of the aqueduct at Croton Dam is 41 feet higher than the end in Manhattan. This was enough to allow water to flow south by force of gravity by 13 and 1/4 inches per mile—enough to supply the city, which then consisted of just Manhattan, with all its fresh water needs. Two reservoirs were built in New York City, one between the present-day lines of 6th and 7th Aves. and 79th and 85th Sts., and a smaller distributing reservoir on 5th and 42nd. The former was drained in 1930 and its site is now occupied by Central Park's Great Lawn. The latter was torn down to make room for the main branch of the New York Public Library, which rose in 1911. Those reservoirs were replaced by two huge tunnels, which were built in 1917 and 1937; a third is still under construction. Central Park's present Reservoir, now named for Jacqueline Kennedy Onassis, was begun in 1858 and was a part of NYC's water distribution system all the way to 1991. 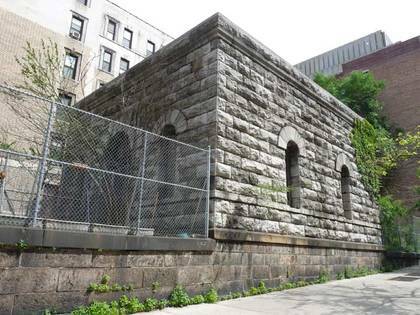 Many of the Old Croton Aqueduct’s New York City remnants are visible in the Bronx and even in upper Manhattan, as are some reminders of the New Croton Aqueduct, built in 1890 to replace the older. At various points along the aqueduct, above-ground structures known as gatehouses were constructed. Under the gatehouses could be found machinery that assisted in routing and directing the flow of water. In Manhattan, there are remaining gatehouses at W. 113th St. and Amsterdam Ave., built in 1876 (now a day care center for elderly); W. 119th St. and Amsterdam, designated a city landmark in 2000; and the largest Manhattan gatehouse, at Convent Ave. and W. 135th St., now being refurbished for use as a theater by City College. In the Bronx, the Old Croton Aqueduct’s length has been carefully marked and designated. After crossing High Bridge, which after years of closure was restored and its walkway reopened in 2015, the Old Croton moved under University Ave. (now Martin Luther King Jr. Blvd.) where it’s designated by a center traffic mall. Above W. Burnside Ave. it resurfaces, where its route occupies a pedestrian mall along Aqueduct Aves. East and West. At the Jerome Park Reservoir, above Kingsbridge Road, part of the reservoir’s retaining wall along Goulden Ave. is made from stones formerly part of the Old Croton. And, much of the Old Croton’s path is now a walking trail in Van Cortlandt Park, continuing into Westchester County north of the park for fully 26 miles to Old Croton Aqueduct State Historic Park. Three Old Croton gatehouses can be seen along the Jerome Park Reservoir at Goulden and Reservoir Aves., Goulden Ave. and W. 205th St., and Goulden and Sedgwick Aves. 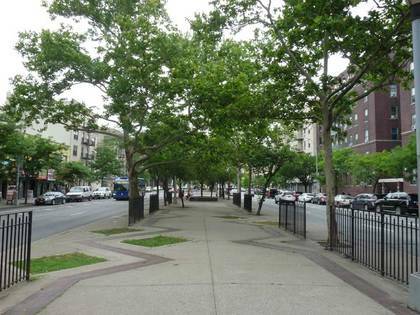 In the University Heights and Fordham neighborhoods, the Aqueduct Walk is raised on an embankment, giving views of the surrounding neighborhoods, or at grade, which requires the stroller to exit it and cross busy streets like W. Fordham Rd. at the nearest crosswalk controlled by a stoplight. 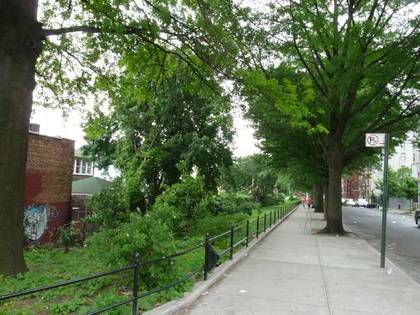 The Aqueduct Walk was New York City’s first linear park; another can be found in Flushing, Queens, where Kissena Corridor Park limns the route of the old A.T. Stewart railway connection from Flushing to Garden City, which was abandoned in the 1880s. NYC’s latest linear park is, of course, High Line Park, which was constructed in stages from 2008-2014 along the former West Side Freight Railroad which ran in Chelsea and the West Side from 1934-1980. There were high hopes for the High Line, but it has proven to be something of a disappointment as it ushered in overdevelopment along its route, forcing longtime businesses catering to the middle-classes to move out, replaced by gleaming glass and metal high-rises built for the superrich; the High Line, while constructed and designed with notable panache, attracts mostly out-of-towners and gawkers. The Aqueduct Walk, because of its location, has remained admirably downscale and is used primarily by the residents in its various neighborhoods as a pedestrian shortcut. It’s lined on both sides with ample trees and flowering plants, and its terrain is pleasingly variable, going up and down embankments. Unfortunately, a beautiful arch bridge that took it over West Burnside Avenue was torn down in the 1920s. A look at the northern end of Aqueduct Walk at West Kingsbridge Road. North of here it’s interrupted until resuming within Van Cortlandt Park. 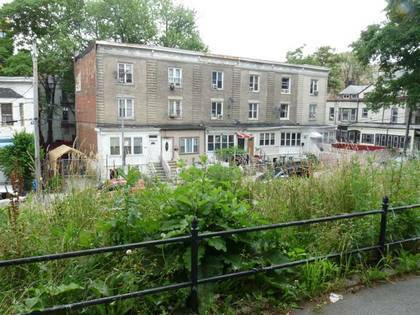 Begin here and make your way south along Aqueduct and University Aves., cross the High Bridge, and finish by walking down Amsterdam Ave. and its gatehouses to Columbia University, and get a look at an unsullied, unadorned urban walkway, the type of which I wish we had more.